Vitamin D is a fat soluble vitamin which is essential for strong bones, healthy skin and a healthy immune system. The vitamin D metabolite known as vitamin D3 is primarily sourced from sunlight acting on the skin of vertebrate animals and it has been called the sunshine vitamin. Vitamin D3 is the metabolite of vitamin D found naturally in animals. Vitamin D3 is naturally present in animal sourced vitamin D rich foods. Therefore, vitamin D3 can be provided from sunshine acting on skin or from vitamin D3 rich foods. Vitamin D3 is transferred via blood serum to the liver where it is changed into the more active 25-hydroxyvitamin D3 (25(OH) D3). The level of 25(OH)D3 is used to measure the status of vitamin D in humans. From the liver 25(OH)D3 is transferred to the kidney via serum where it is further changed to an even more active form of vitamin D known as 1,25dihydroxyvitamin D3 (1,25(OH)2D3). 1, 25-dihydroxyvitamin D3 is a highly active hormonal form of vitamin D and functions in most cells of the body by attaching to vitamin D receptors within each cell. Vitamin D receptors can be found in bone, skin, muscle and brain cells. 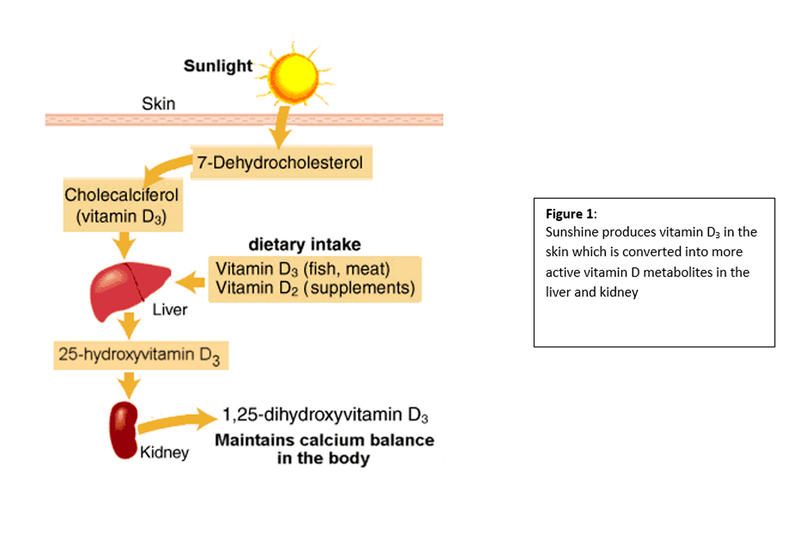 A schematic diagram of vitamin D metabolism in the human body is found in Figure 1. The term vitamin D is a collective term for all vitamin D3 metabolites. Vitamin D2 is the vitamin D metabolite of plants and fungi such as mushrooms. Vitamin D2 has significantly lower levels of vitamin D potency in human nutrition.